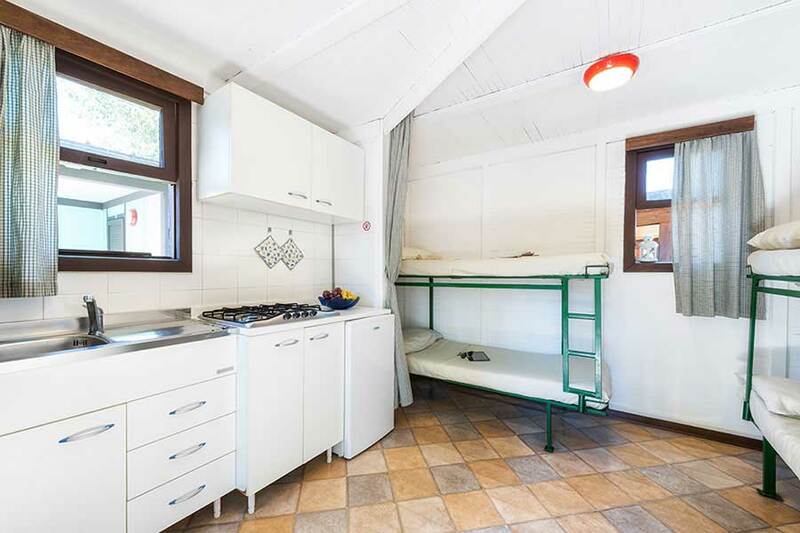 Wood-built one-room Bungalow, with two bunk-beds, a kitchen unit with refrigerator and sink; bathroom with toilet and hand-basin. Hot water, not provided with shower. 200 V. power points. Patio with table and chairs. 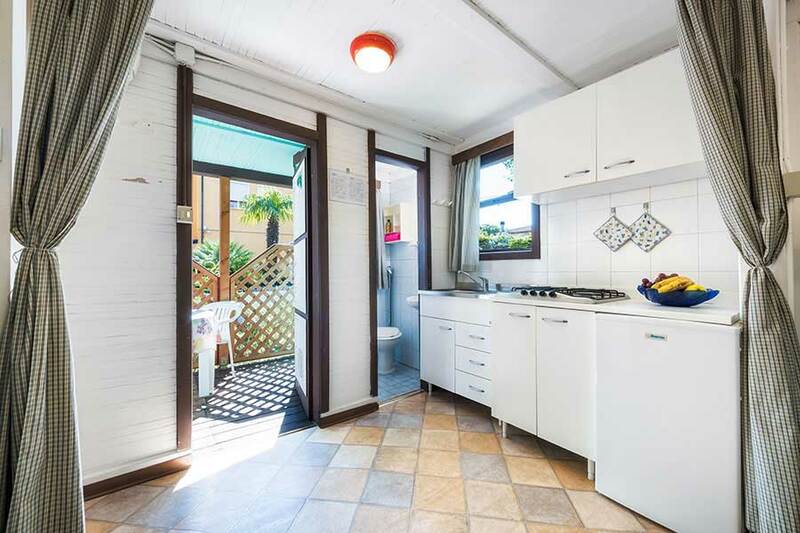 Booking for Bungalows and Maxi Caravan: deposit 25% of the budget. Reservations must be made by the persons who will be staying in accomodation. Reservations may be transferred to third parties without the permission of Camping Village Al Boschetto. Final cleaning: is included in the price for stay of minimum 7 days, but only if Guests leave the accommodation clean and tidy. If the accommodation is not clean, the Management will charge € 60,00 for the final cleaning. Our Staff will check the living unit before the departure of the Guests. Bed linen NOT included in the price. Equipment: Covered terrace, table and chairs, complete dishes, blankets and pillows. The delivery of the key will be guaranteed starting from 5.00 pm. Nevertheless, it is possible to check-in from 10.00 am and wait for the availability of the unit within the campsite, preferably not in the vicinity thereof. 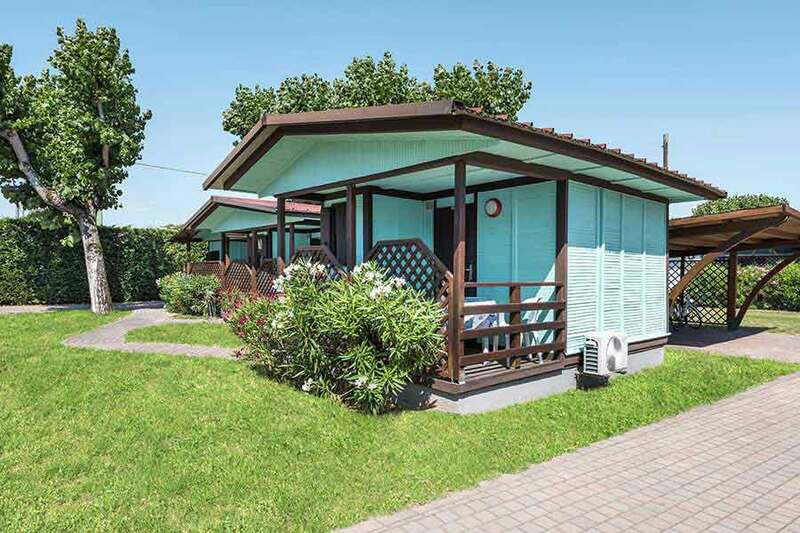 Bungalows and Maxi Caravans are quoted on the basis of double occupancy ( min. 2 persons ). The number of occupants cannot exceed the number of beds stated. The daily rate consists of the cost of the accommodation unit, including parking for one car, plus a charge per person 8 based on the number of guests occupying the unit). The accommodation rate includes water, electricity and gas consumption. The price for the final cleaning is included. Towels are not supplied.